When the Nastran-computed Failure Index is greater than 1, failure is predicted in the ply (and with first-ply failure theory, the laminate as well). You look at the same strain output that you normally do (e.g Lam Ply1 X Normal Strain), but the Failure Index is higher than as calculated by hand. Something doesn’t add up, so what gives? This is calculated by Nastran. It is not necessarily the strain that results in the ply from the loading when you consider boundary conditions, layup, and other influences that must be solved for. That value is called the elastic strain, ε_elastic. The NX Nastran documentation is a little inconsistent in labeling, but I believe the terms elastic and mechanical are interchangeable. What’s happening is that the reported strain for that ply is the total strain, ε_thermal + ε_elastic1. A situation can develop where the ply is constrained against expansion. This could in theory be due to SPC constraints around it’s boundary, or if its sandwiched between plys of substantially different CTE. In these cases, the thermal strain (positive) is equal to the elastic strain (negative), and they essentially cancel each other out. Then your hand calculation that uses total strain is quite wrong. Enter the new case control commands THSTRN and ELSTRN to recover thermal and elastic ply strains, respectively. Note this only works for 2D laminate elements. 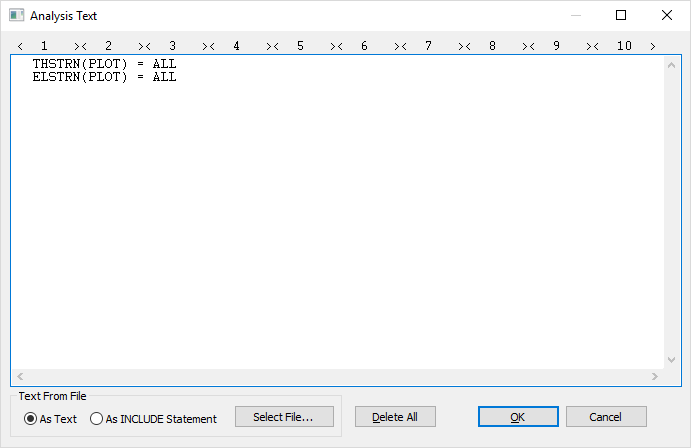 Confirm with preview of analysis (right click on the Analysis, select preview). 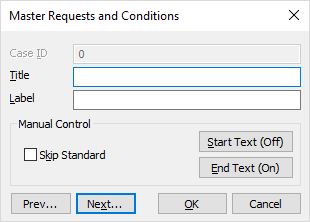 The two lines we added as Case Control End Text show up just before the standard BEGIN BULK line. 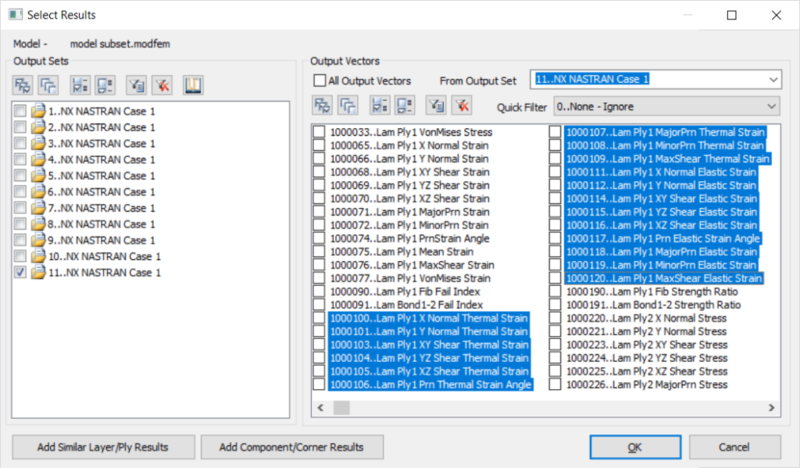 1 – NX Nastran 11 Quick Reference Guide, pg 4-22, “In a linear static analysis, the strain output are total strain – mechanical strain plus thermal strain”. 2 – Siemens TAN 4548. Find in GTAC database. 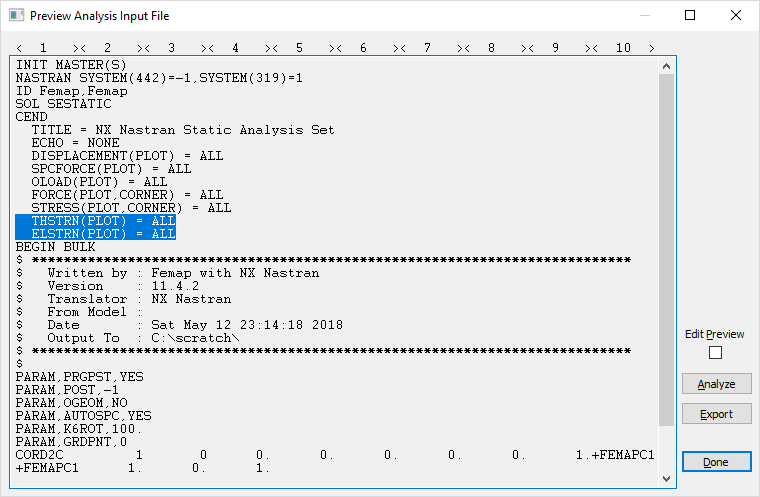 3 – NX Nastran Problem Report 6549455. Find in GTAC database. ← Free student version of Femap now available.